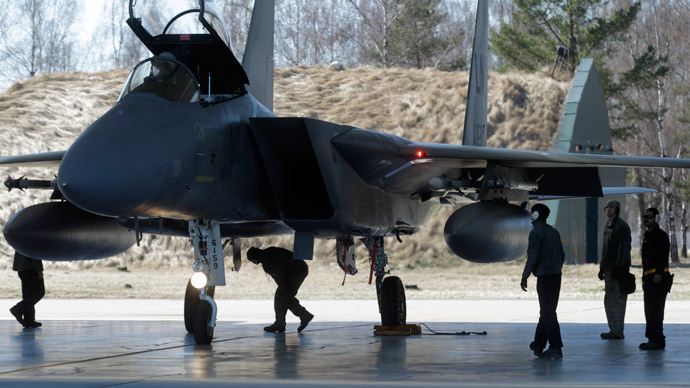 Lithuania is conducting its biggest military exercises since joining NATO in 2004. Meanwhile, 200 extra troops are set to arrive at the alliance’s headquarters in Eastern Europe, located in Szczecin, Poland. “The huge allied presence demonstrates solidarity with the countries of this region,” Major General Almantas Leika, who is in charge of the country’s land army, said as the annual Saber Strike military drills began. Lithuania is one of 13 countries participating in the exercise, which will involve about 6,000 troops performing manoeuvers in three Baltic states and Poland until June 19. During the two-stage exercise, land and air forces will carry out joint operations in the field, and then commanders will conduct a separate computer simulation of a regional conflict. “This exercise is an opportunity to give one more demonstration of both our armed forces’ and our strategic partners’ abilities to organize military drills of such scope together and to continue honing interoperability,” said Leika. Lithuania, Latvia and Estonia have jointly asked for permanent NATO bases to be located on their territory, saying Russia has the capacity to invade them within four hours of ordering an attack. Moscow has lashed out at the move, saying it contravenes the 1997 NATO-Russia Founding Act. In another expansive move, officers from over 20 NATO member states will begin arriving at the alliance’s base in Szczecin, Poland on the country’s border with Germany, as it begins an upgrade that will be complete by 2018. “Ultimately, the number of military personnel will be doubled to 400 soldiers, along with key liaison officers of the air force, navy and special forces,” said the head of the Staff Corps, General Lutz Niemann. The officer explained that the expansion, agreed upon by NATO states last year, was a response to the crisis in Ukraine. Niemann said the headquarters would be used to co-ordinate specific tasks within larger NATO operations, or serve as the headquarters for smaller-scale campaigns, as well as coordinating future drills. NATO has intensified its military exercises in Eastern Europe in the past few years as the block’s relations with Russia have threatened to reach Cold-War lows. NATO Secretary General Jens Stoltenberg recently promised that the alliance was going to increase activity along its eastern borders, with more air and sea patrols, as well as regular drills. NATO is currently getting ready for the latest round of naval drills set to get underway just miles off the Russian coastal exclave of Kaliningrad, a gulf area sandwiched between Poland and Lithuania. The exercise will kick off on June 5 and will last for two weeks. The games will feature participants from 17 countries, mostly NATO members. Sweden, however, is among those without NATO membership, and the games are largely seen as a signifier that the country is seriously considering entering the military block. The UK has announced that it has sent its biggest warship for the drills. The overarching theme of the exercises is fear of Russia, intensified by Baltic neighbors and their allegations of Russia’s activities in Ukraine. Russia has responded with promises to ramp up security in Crimea. “Naturally, we will increase our forces in Crimea because NATO countries have stepped up their activities… in the immediate vicinity of our borders,” said Russia’s envoy to NATO, Aleksandr Grushko, in mid-May. Russian envoy to NATO Aleksandr Grushko called the alliance’s belligerent rhetoric towards Moscow an “outdated” tune. The envoy added that NATO’s perceptions of military threats are artificially created to justify its anti-Russian stance with baseless accusations of security threats. “It seems like some states, for various reasons, including internal political, enjoy being in the front-line, requiring special attention, special protection. And what is most important, [these countries] continue to search for more enemies and to write off their own mistakes whether in foreign policy or internal under the guise of some mythical threat from Russia,” Grushko told Rossiya 24 TV channel last week.